Four trips on four airlines between Europe and the US East Coast (BOS, JFK, IAD, MIA) in 2014-16 on Air France Jump to review, British Airways Jump to review, Lufthansa Jump to review, and Singapore Airways Jump to review. Great Food, witty staff, so-so IFE and an abysmal hub-airport. Air France lives up to the cliché of „Living Like God in France“ and caters well for its guests. Even on the short connecting flight from Munich they find time to serve you a nice G&T and a sandwich. Lunch on the long-haul featured a bell-pepper salad with apricot dressing, a really nice chicken dish with roasted potatoes, cheese, fruit compote and a super-tasty clafouti (cherry cake). To get you started in the appropriate mood, AF offers crisp French champagne as well as the usual longdrinks. Wines with the meal were as good as the coffee afterwards. The pre-landing meal, was a nice assortment of typical French snack items such as gallets (cookies) and cottage cheese served on a small tray rather than in a cardboard box. The FAs featured the typical Gaulish quick-witted humor and I overheard this memorable exchange when an apparently American passenger, wanted to pay for his headphones and got in reply „Oh, its free – we put it in your ticket“. AF has economy class seats on the upper deck in some of its jumbos. Seating in the exit rows is on the narrow side (due to the IFE-monitor in the armrest). Flying in the small and neat „first floor“ cabin indeed feels special. IFE lacked a daisy and there were no inflight amenities other than blankets and pillows. The worst about the AF experience remains beyond the airline’s control, as the Charles-de-Gaulle-experience will reliably ruin the best of trips. Worn-out seats, tired planes and skimpy catering, featuring the coleslaw salad from hell. BA once was a flying ambassador of Tony Blair’s 1990s „Cool Britannia“ – but that was a long time ago. Nowadays, cuts are ubiquitous and from what I read on the web, service deteriorated even more since my last trip with them in 2014. Lunch and dinner choices on the four legs I flew on their tired 747s always were soggy pasta or the ever so boring chicken curry dish. Their salads and desserts are mostly pre-packed long shelf life products with chemical aftertaste. Beware the coleslaw from hell which is extraordinarily nasty. Little extras such as cheese and crackers or chocolates have long been slashed. The bar service ist still good though, and the FAs mix their Bloody Marys and G&Ts with dedication. Wines can be hit and miss (avoid the chardonnay from Chile) while the beer selection is actually quite good with Fuller’s London Pride ale and continental lager on offer. By the time I flew, BA even had Glenlivet single malt whisky in economy but I understand this treat was also dropped in the meantime. The seats were completely worn-out, with super-tight pitch, small, flickering IFE monitors and bits and pieces falling off on every flight. Fuzzy blankets, cheap headsets and thin pillows covered in paper-like pillow cases added to the charter airline feel. A small toothbrush at the seat was the only saving grace. IFE offers were super in theory, yet hardly visible on the ageing LCD-screens. 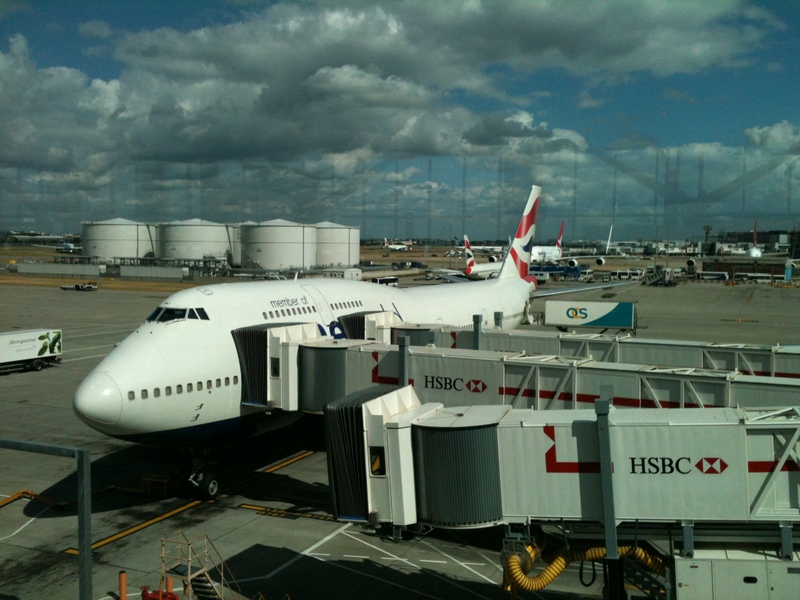 Changing planes in London-Heathrow is almost as unpleasant as in Paris-CDG, not BA’s fault, however, and they definitely try in their own terminals. *These items have been replaced by miniature candy bars in 2016 during BA’s slashing of the 2nd meal service on shorter transatlantic flights. Catering on European connections has been reduced to buy-on-board food and drinks early in 2017. Sticking to their standards while other carriers lowered theirs over decades made Lufthansa one of the best airlines across the pond. My home carriers always used to provide a solid, yet somewhat boring product. Their late introduction of personal IFE-screens, bland meals and high prices used to keep me away from them, yet in recent years they have updated their fleet and also regularly come out with good deals across the Northern Atlantic in economy. In an ambitious programme to become the first european 5-star airline, LH has polished up its lounges and cabins, however, most of the money obviously went into first and business class. As of May 2017 this investment has not yet paid off as LH still only has a 4-star ranking, yet a closer look at the tables at SKYTRAX shows that they are getting close. During my three segments I experienced spotless and comfortable cabins no mater whether the plane was brand new Boeing 747-800 new or a 10 years old Airbus A330. 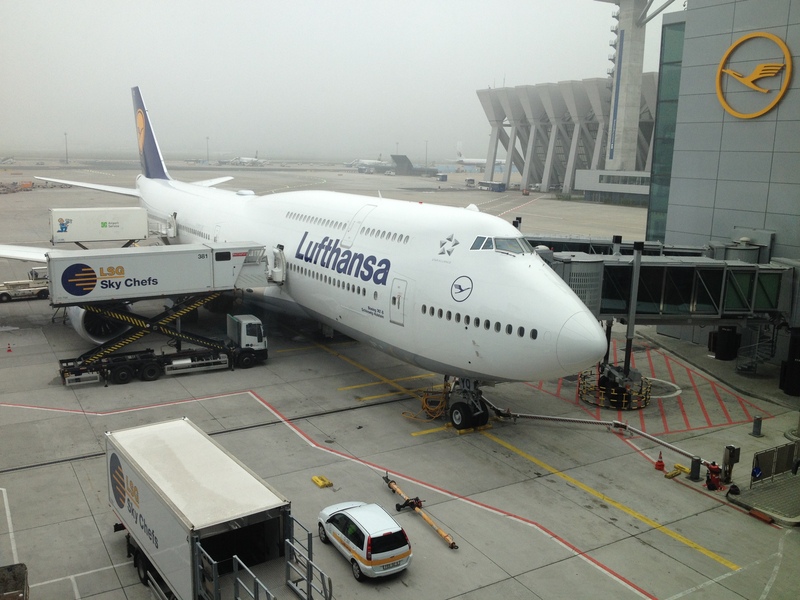 Service-wise flying on LH was hassle-free and pleasant. Their FAs may not be as overenthusiastic as on other carriers, yet I always found them to be friendly, professional and hospitable. If you like efficient organisation, you will be impressed by LH’s meticulously choreographed service „ballet“. Every economy class passenger will have a pre-dinner cocktail with some crackers at their seat within a few minutes after the fasten-seat-belt lights are off. Hot towels follow before lunch/dinner is served. Choices on my flights included the usual pasta along with some more interesting non-vegetarian options such as Thai beef or grilled salmon. Second service also includes hot towels and a choice of samosas, or melt cheese sandwich (westbound) or a small continental breakfast (eastbound). The main meal is served with metal cutlery and on stylish (as far as plastic goes) trays and dishes. Drink service is comprehensive and includes Campari and OJ – LH’s unofficial signature drink – German sparkling wine and an after-dinner offer of brandy and whiskey liqueur. Ironically for a German airline they only serve one brand of beer – Warsteiner of all – one of Germany’s most boring and bland lagers. (If you happen to land in Munich please head straight for Airbräu to find the real stuff!). Seats were comfortable and blankets and pillows gave a high quality impression. IFE was on-demand and choices were good, the headsets, however, a little shabby. Delicious meals, attentive FAs, and comprehensive IFE win SIA the „blue ribbon“. Singapore Airlines is one of the few airlines with a SKYTRAX 5-star rating – and little wonder they are. The quality and consistency throughout is impressive, to say the least. Be it major service points such as food, seats, IFE and a generous baggage allowance (2×23 KG bags) or details such as offering night-before check-in at a distant outstation or offering steaming, nicely scented cotton towels before every meal. SIA just never makes do with average. Food and drinks offers were plentiful, fresh and delicious, Kris-World IFE is massive, there is Givenchy amenity kits, Bombay Sapphire gin and Tiger beer. Life in economy class just does not get any better! The only slight criticism would concern the weird peanuts they serve as snacks. I have also noticed that FAs, while being very attentive and friendly, easily get „derailed“ by any request or question that is slightly out of the ordinary. To be fair, SIAs is just a tiny player in this market with just one pair of transatlantic flights between FRA and JFK. 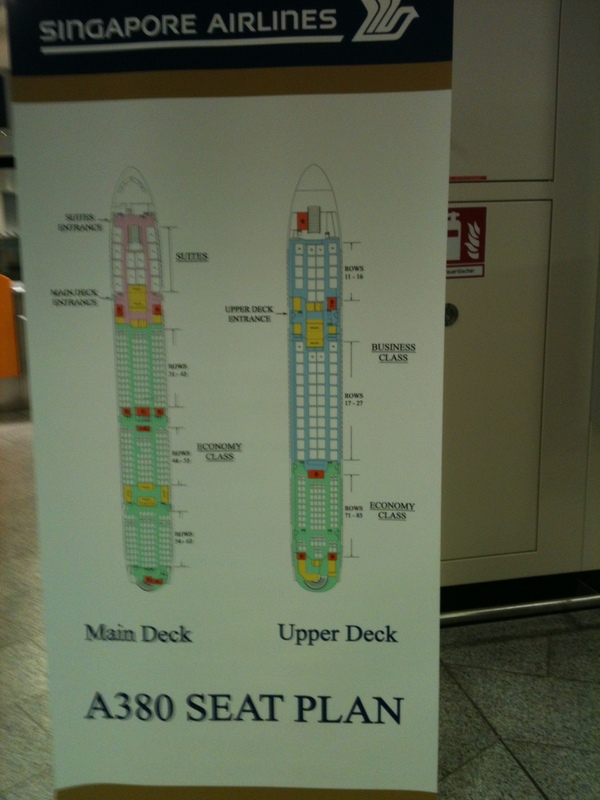 However, if you get the chance to fly on their A380, do not think twice!